Summary: Powerful, passionate, political film-making and deservedly award-winning, catch it if you can. Palestine. The Occupied Territories. Israeli soldiers, in their attempts to control the disputed border country, take over Palestinian houses to use as bases for their manoeuvres. Into one such house, the home of middle class school teacher and Shakespeare fan Mohammed (Bakri), his wife and five children, come a squad of youthful Israeli soldiers led by Captain Ofer (Miller). Their house now belongs to the Israeli army, and they have to leave at once. When the family, led by Mohammed, refuses to go, the soldiers offer them a deal: they can have the first floor as living quarters; the soldiers will take over the bedrooms on the upper storey. At night the family will be locked in the living room where they will stay until released in the morning, and they must never, ever go upstairs. It’s a rare and exciting thing in cinema to be given a glimpse into a world which you otherwise wouldn’t be able – wouldn’t even be aware of – to imagine. Its as shocking to the family when the soldiers burst in as it would be if troops suddenly came into your own home, and they have exactly the same problems adjusting as any nice middle-class people with aspirations would. At first, slightly disbelieving, they follow orders in an disbelieving, numbed fashion, while arguing amongst themselves – wife Samia (Omari), worried about her children, wants to leave, but Mohammed insists that they should stay; believing as he does in non-violent protest, he wants to find a way of living with the soldiers. His principles are tested in more ways than one – violent confrontation, but also the ever present fear of violence – and the family begins to fall apart under the strain of their new lifestyle. 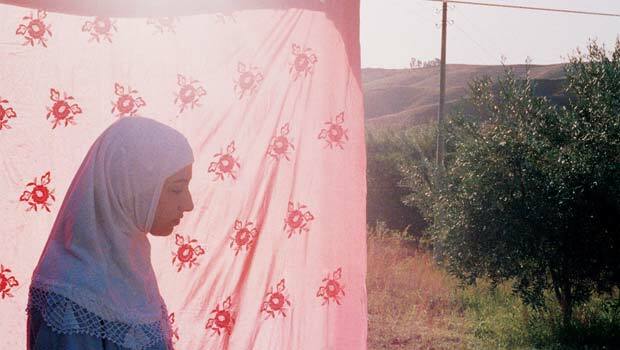 Mohammed’s insistence that this is his house, his land, and he will not leave it, divides the family, as Samia worries more and more about her increasingly traumatised youngest children, becoming introverted ghosts in a matter of days; Mariam (Ayoub), the oldest daughter, increasingly politicised and angry, wants to fight back, while teenage sons Jamal (Karem Emad Hassan Aly) and Karem (Marco Alsaying) react in opposite fashions – one wanting to get away, the other attracted to a more violent solution. Mariam, thwarted by her father’s non-violent beliefs, is perversely curious about the soldiers, and takes to creeping around the bedrooms, hiding in cupboards to spy on them. I hated this section of the film, finding it really hard to watch, rigid with fear that she would be discovered. But through her spying she finds out enough about the soldiers to humanise them and make them less monstrous. Through Mariam’s eyes we see that the soldiers are very young; that they like football; that one plays the guitar; that none of them really want to be there. She uses this information to allay her little brother’s fears; a risky strategy, as she comes to discover. Private is not an enjoyable film in the sense of being an entertainment but I found it both powerful and important. These are not faceless suicide bombers or vengeful patriots, easily dismissed fanatics; just people driven to despair by the circumstances in which they find themselves. The painful scene of a small child crying for the toilet will be familiar to all; what is not is that the child is not allowed to leave the room to go, and the mother’s helplessness in the face of her daughter’s agony. By illuminating the family’s stress, as well as that of the soldiers, the film shows how easily ordinary lives can be destabilised, and ordinary people forced into actions they would not normally contemplate. The tension is constantly ratcheted up – just when you think the stress levels can go no higher, the screws are tightened a little more, until its almost unbearable. Private is based on a true story, and has no happy ending. Powerful, passionate, political film-making and deservedly award-winning, catch it if you can.